COLUMBUS, Mississippi -- Math and science education may be the first thing most people think about when thinking about MSMS, but as the annual Sites and Sounds tour shows, MSMS is much more than that. Last week the 42 members of the MSMS Blue Notes spent four days and nights touring the southern part of the state of Mississippi. During the tour the group played shows, visited museums, and learned about the musical history and culture of their home state. Visiting legendary MSMS educator, Dr. Nancy MacNeill (pictured front right). The group left the school on Friday, November 6 and made their first stop in Meridian. A highlight of the Meridian stop was a visit to Brookdale Assisted Living, where legendary MSMS educator Dr. Nancy MacNeill is a resident. The Blue Notes crooned cool for the facilities residents, and got to spend some time with Dr. Mac. After visiting Dr. Mac, the students made a stop at the Jimmy Rodgers Museum, THE DENTZEL CAROUSEL, visited a spot on the Mississippi Blues Trail, and visited the African American Military History Museum in Hattiesburg. Families of Blue Note members treated the group to a BBQ Dinner in Purvis. Eventually, the Blue Notes would make it all the way to the Mississippi Gulf Coast, where the evening was capped off with a beach bonfire and s’mores. Click here to watch the Blue Notes in action! Thanks to Dr. Heath Stevens for putting this playlist together! Saturday the students headed over to Barksdale Pavilion at the Gulfport Marina. The MSMS Blue Notes made their 5th appearance at the “Red, White and Blue Festival,” the culminating event of the Gulf Coast Veteran’s Day Parade. 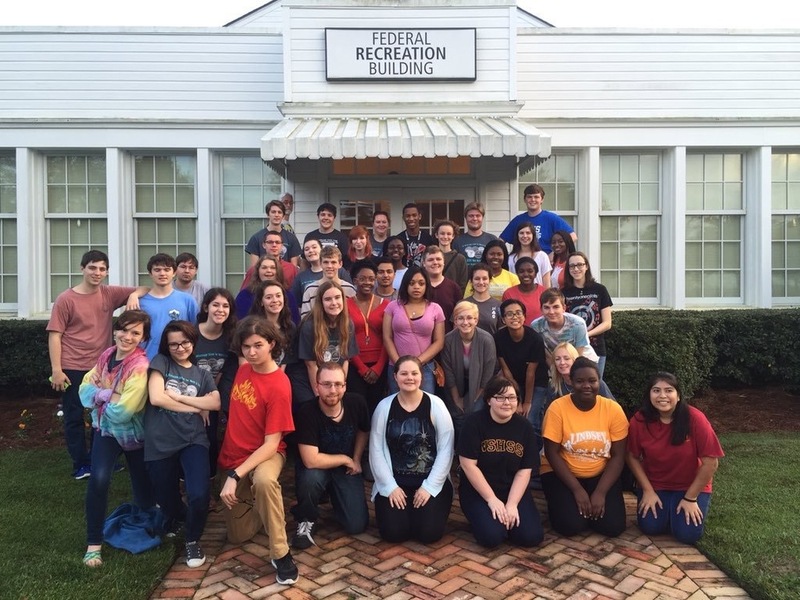 Following their performance the students toured the historic100 Men Hall in Bay St. Louis before making their way back to Biloxi for dinner and an impromptu performance at the dinner venue. Sunday, the MSMS crew loaded up and headed outside the state, to the musical landmark that is the City of New Orleans. In New Orleans, the Blue Notes ate brunch aboard the Steamboat Natchez while listening to Dixieland Jazz and cruising the river. Leaving the Crescent City’s undeniable musical mojo behind, the weary travelers headed to Laurel for dinner with Blue Note Parents before pointing the caravan north to Columbus. "It was a most triumphant trip,” said MSMS junior Sam Williams. “We learned about many of the excellent artists who contributed to the bodacious music of Mississippi and the south as a whole." MSMS and the MSMS Blue Notes would like to thank The Williams, Williamson, Vial, McNamee, Eubanks and Jackson families, MSMS Blue Note Parents, MSMS Plus, Ms. Kelly Brown, the Truitts, Mr. Jed Leggett, Ms. Julie Heintz, Mrs. Debby Billups, Mrs. Nesia Foote, Mr. Charles Williams, Dr. Germain McConnell, Dr. Clyde Lindley, Dr. Bill Odom, Dr. Elizabeth Morgan, Dr. Heath Stevens, Ms. Cindy Henderson, Ms. Kassie Brooks, the MSMS Foundation, Seashore United Methodist Assembly Center, Seashore District United Methodist Churches, First Baptist Church of Purvis, Golden Triangle Periodontal Center, Carsons Store and Deli, Image Screenprinting, East Mississippi Community College, Lion Hills Center and the MSMS Faculty.